Snack Girl has begun to receive many products and books for review on the website. If I don't like something, I usually just don't mention it - why be negative? There is so much negativity in the world! BUT, this one I had to write about, because it made me sad. I received a packaged of Kashi GoLean Crisp! Toasted Berry Crumble in the mail and I thought, "Hey, cool, I already like their Kashi Roasted Vegetable Pizza and I kinda like their Kashi Crackers." Is the first ingredient whole grain? Yes! Whole grain oats. Is sugar the second ingredient? Here is where the problem starts - yes - evaporated cane juice crystals (AKA sugar) is the second ingredient. Is there at least 4 grams of fiber in one serving? A whopping 8 grams of fiber is listed on the box! When I opened the box, they smelled like Fruity Pebbles. My children absolutely loved them and demanded that I buy more. So, what is my problem? The sugar is my problem. The ingredient list is CHOCK full of sugar. Not only do you have "evaporated cane juice crystals" as the second ingredient, but you also have brown rice syrup and evaporated cane juice (listed twice more as sugar for the berries). So that means that sugar was listed FOUR TIMES in the ingredient list. Perhaps SUGAR should be listed before whole grain oats as the first ingredient!! But, you don't really have to know all these names. Just taste it - does it tastes really sweet? Then, there is a lot of sugar in it - no matter what the box tells you. Why am I concerned about sugar in my breakfast cereal? Eating a lot of sugar to start you day inevitably leads to a "crash" around 10 AM where you feel exhausted and hungry. Now, you need a snack to keep you going. If you had eaten something with complex carbohydrates and protein such as Overnight Pancakes , Soft Boiled Egg, Overnight Oatmeal, or DIY Cereal, you will last the morning and have more energy! What to do if you love this cereal? Well, I would buy some Cheerios or other sugar-free cereal and mix it with the sugary stuff not unlike what I suggested in Cut Soda Consumption in Half. Slowly cut back on the sugar cereal until your tastes buds recognize it as WAY too sweet. 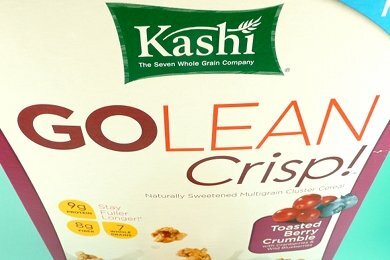 Have you ever tried Kashi GoLean Crisp? I have found that not all Kashi products are equal. Like you, I enjoy the pizzas, but that's pretty much it. Their so called "healthy food" fails my personal test more often than not. I am becoming more and more disappointed with cereal - having decided that Kellogg are the *devil*, what with their adding fake fibre and marketing sugary junk at children, I headed for a box of supermarket own-brand all-bran, and found that it had 11g of sugar per serving!! I've given up on cereal. Well, not really, but so ar I haven't found a healthy cereal i actually like. Cheerios are great if I dump a tablespoon (or 2) of sugar on top. And I haven't found any Kashi products I thought were edible. I am a failure when it comes to health food. I've had to compromise with a granola that has great whole grain ingredients but more sugar than ideal. Then I use that as a crunchy filler for my lowfat yogurt. But if I'm just sitting down to breakfast cereal I'll take Sugar Frosted Flakes or Capt'n Cruch with Crunch Berries every time. So I avoid breakfast cereal as much as I can... that way lies madness for me! I have to admit that i've started to not eat cereal as much because it really gives me cravings for more carbs and it just does not satisfy me. I love Nature's Path Flax Plus with Raisins and Pumpkin Seed! I'll look for that one on Friday Sandra. Hope springs eternal that I'll find a healthy cereal I like! I make homemade granola...has 1/3 cup of honey for 15 servings! I add raisins and that's it...has oats, all bran, soynuts, wheat germ, and unsweetened coconut...so yummy and so filling! I like Kashi in general (Pizza, Red Curry Chicken, Creamy Truly Vanilla), but this cereal has *WAY* to much cereal. Although if you look at Uncle Sam Cereal, it also is high in calories, but has virtually no sugar! What gives?! I've found that when I was weighing myself everyday (just to keep track) and I WAS doing so well with exercise & eating...If I had a bowl of cereal...BAMM! the next day weight would always be 1 or 2 pound higher! PLUS, cereal always left me wanting more, AND tired...Bummmer. My body was trying to tell me something! Most recently, I have been doing a bit of food elimination, (aka no wheat, no milk, no eggs, no cheese) for a possible food allergy (already have a nut allergy and that was one reason no cereal for me)...and in just 2 weeks, with no extra exercise (actually none) I lost 10 pounds! Something about that! My diet right now only includes meat, veggies and fruit. I'd recommend Fiber One (only 60 calories and 14 grams of fiber)...add all the fruit (blueberries, blackberries, strawberries, raspberries, bananas) that you want. It will fill you up and it's so sweet (no added sugar) that you'll think you're having a dessert. By the way, it makes for a great snack too. And, it reduces your desire for ice cream because it's so sweet. Nope, I do not work for Fiber One. I lost 30 pounds by eating it for breakfast every day. Since I'm new to all this my question is are Raisin bran and Kix a healthy choice? I had to completely quit eating cereal - it's virtually impossible to eat one serving, and if you eat more than one, it's like 500 calories. Just not worth it - if I'm eating 500 extra calories, it's gonna be chocolate! Great write-up on analyzing whether a cereal is healthy or not. Hopefully, people will be able to take what you've written here and assess other cereals in the same vein. This is good. I'm gonna post it on my FB biz page tomorrow. I almost got taken by the new L'Oreal shampoos that are "sulfate-free" until you look at the label and see that they just substituted a bunch of other bad chemicals. I feel the same way sometimes about organics. Just because it's organic crap doesn't mean is isn't still crap or processed, etc. Thanks for digging deeper. Kashi used to be a small, independent healthier brand until it was bought out by corporate interests who are now diluting the quality and capitalizing on the brand name to sell more processed junk. I like the regular Kashi cereal. With plain yogurt and real berries. I tried that stuff and it was way too sugary for me. Great tips! For more ideas on how you can take charge of your own health care, check out Whatstherealcost.org.